Many kids and grown men have bragged about the amount of candy they housed on Easter Sunday, but could they take on the Easter Feast? The new special is the work of Manchester's new cereal-only cafe Black Milk Cereal Dive, and it contains a whopping 97 teaspoons of sugar. 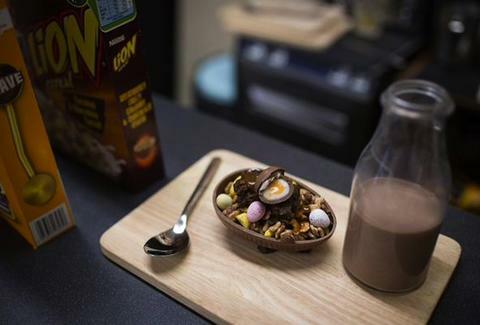 Served in a chocolate egg "bowl," the breakfast contains two types of British cereal (Krave and Lion), brownie bits, Cadbury Mini Eggs and a Creme Egg, marshmallows, and M&M's. It's further drizzled with a homemade dulce de leche and a salted caramel sauce, then "finished" with chocolate milk. You'll probably need to brush your teeth before, after, and during just to preserve your gumline, but the special is only £4 (about $6). And you can't argue with those savings. Kristin Hunt is a Food/Drink staff writer for Thrillist, and thinks this special is what Easter's all about. Follow her to sugar rushes at @kristin_hunt.